﻿﻿BAiP offers a wide range of social activities. If you are an eligible neighbor, why not participate or think about leading an activity? ﻿Our neighbor-to-neighbor volunteers are here to assist members with medical visit escorts, small errands and more. 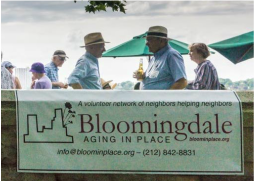 THE MISSION of Bloomingdale Aging in Place (BAiP) is to help older adults lead vital, connected, safe and comfortable lives as their needs change. An all-volunteer, intergenerational network of neighbors, BAiP builds community by organizing social activities, sharing information, and extending a helping hand to neighbors as they continue to age at home. Membership in BAiP is free and open to all adults in our defined neighborhood. While modest, our budget must be raised each year. If you wish to support BAiP or learn more ways to become involved, please click here. The image above by member Margaret Kavanau is from our Photo Group's latest gallery "Yellow." The group's galleries are viewable here. Click here for past news items. Click the image above for a slideshow of images of BAiP in action -- from our farm fresh foodbag distribution to community volunteering with students to a variety of social activities. BAiP has something for all older adults in the neighborhood. 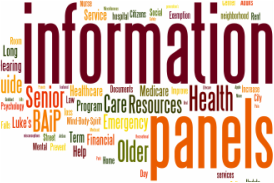 An intergenerational conversation on Climate Change sponsored by BAiP was recently featured in a piece by the Columbia University Mailman School of Public Health. ​Other press clippings may be found here .